Amber, reddish colour. Orange. A thin, clear band of gold, like silicon around a bath….. Very fast legs, very young, very thin dram. Apple brandy. Alcohol tingle to nose hairs! Oily, like fine oil on a concrete garage floor. Very abrupt, high green notes. Strange perfumey, dustery notes. Reminds me of an old piano keyboard…. Paraffin, or something like that, sulphur. Underneath, very far underneath, I recognise a Laphroaig. Tomatoes, plum tomatoes – acidic. Like dogs, animal, oily gutted fish. Something outside… mushrooms..? Oh crikey, I don’t like it! I cannot believe the same person who created Lore created this. 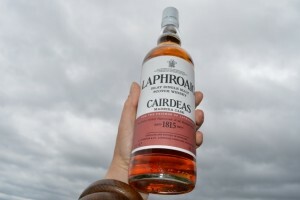 I am never keen on the Laphroaig Feisle bottles…. remember the banana one?? Laphroaig are very clever. They create drams that cut across the palate spectrum of us all. So, maybe YOU will love it!